We've developed a convenient online program that will help you obtain your motorcycle license sooner rather than later. Register for our DMV Motorcycle License Practice Test to gain the knowledge you need to pass the exam on your very first attempt! With our assistance, you'll learn the answers before taking the DMV exam! What are you waiting for? Get started today! Registering for our DMV Motorcycle License Practice Test means that you won't have to spend hours reading a manual or handbook; now, you can learn online, whenever your schedule sees fit! Not only will you learn the answers to motorcycle test questions, but you'll receive detailed explanations on why your answers were incorrect in the event you were wrong. Put simply, we've made learning fun and simple! Once you enroll, you will be asked 20 random questions regarding road rules and road signage identification. Feel free to take the practice test as many times as you want; the questions will change after each login. After you've successfully taken and passed each test at least five times, we guarantee you'll pass the real exam on your very first attempt! If you don't, we will give you a full refund for the price of the course. Important Note: motorcycle driver's licenses are issued differently according to the state you live in. We recommend visiting your state's DMV website for specific details. Backed by rave reviews, our program will teach you facts you won't learn anywhere else. We've assisted other drivers - let us help you! Our program has been designed to help sure you obtain your motorcycle driver's license. Before you register for our DMV Motorcycle License Practice Test, take our quick sample quiz-it's easy and free! Once you've gauged your knowledge on the test questions, take advantage of our comprehensive practice exam. 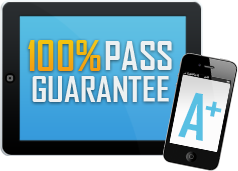 With a 100% money-back guarantee, you've got nothing to lose!